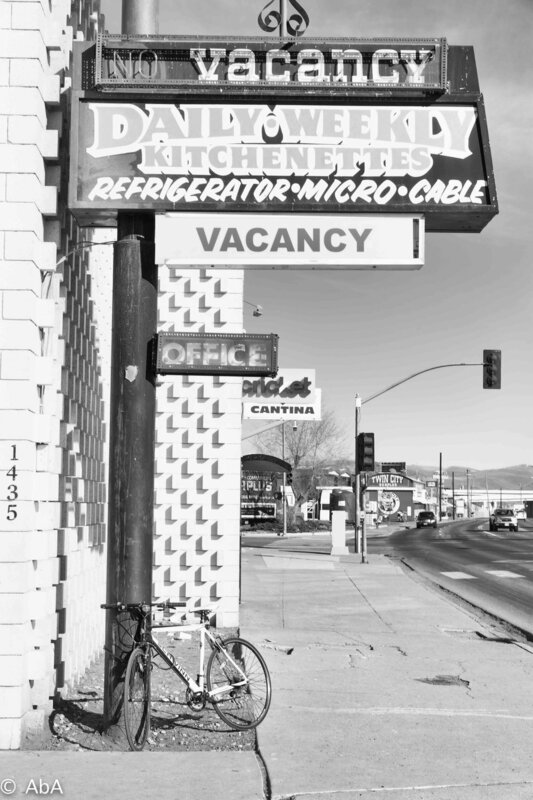 Steven Weidman says he hasn’t considered himself a street photographer for very long, but recently he has been contributing both street portraits and now black and white photography of different alleys, motels, bars, stores and signs of Reno, to Our Town Reno, some of which we highlight in this article. Q: You are currently taking pictures of alleyways, old signs and street art. What attracts your lens to these? Steve Weidman: I have been taking pictures of alleyways, old signs and street art, on and off for many years. I am drawn to angles, textures, and street art. 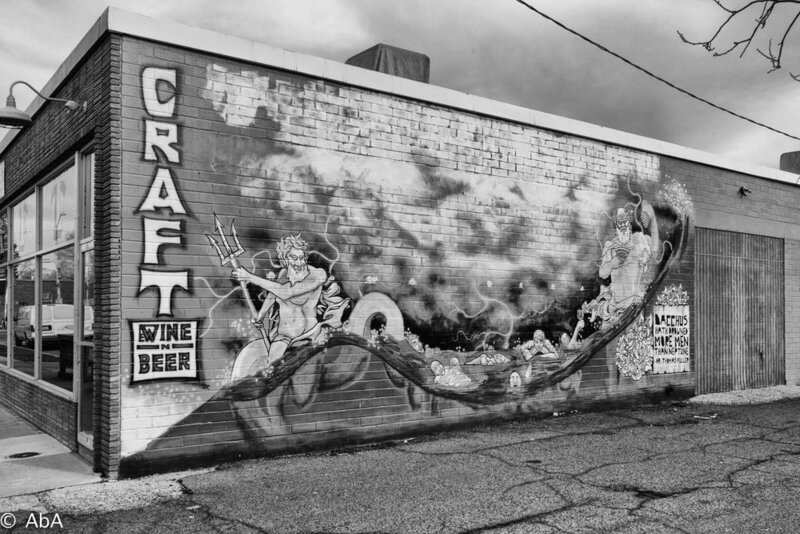 I started photographing graffiti many years ago when I lived in Indiana. I have photographed old and derrick buildings for years and have not reproduced these photos other than to view them myself. With OurTownReno.com I now have an outlet for many of my photos and it has rekindled my interest in these subjects. At this time, I am using black & white film to photograph portraits of people, in particular the homeless. I am using digital photography to photograph things. I have just started experimenting with black & white in the last nine months or so and I am quite fascinated with the results. I have started to convert color digital images to black & white images because the results can become very striking. Q: What do you think of Reno's current changes? Steve Weidman: I relocated to Reno in 1986 to help start up a new printing division for what was at that time the world’s largest commercial printer. Reno’s layout hasn’t changed that much in the core portion of the city but the population has grown largely in the surrounding urban areas. In 1986 there were no rush hour traffic jams on I80 or 395. The population has doubled but the road system has not. When I moved here I lived east in Hidden Valley and there were no housing developments south. McCarran was not complete around Reno at that time. Reno has gotten bigger but not better. There were few homeless in the 1980s but (the situation) has gotten progressively worse as the years have gone by particularly in the last ten years. Lack of affordable housing and unchecked growth have exasperated the problem. But I still love Reno sores and all. Q: What do you think of the Whitney Peak planning to demolish the oldest downtown Reno building (the 1872 Reno Mercantile and Masonic Lodge) to expand its own hotel? Steve Weidman: I think it was allowed to fall into disrepair so that it could be demolished for new construction. My wife emigrated from Germany and I have made eight trips back there with her and have observed how Germans and Europeans respect their old buildings. Many buildings and structures are hundreds or even over a thousand years old, to them to allow a building to fall into such disrepair is almost unthinkable. My sister-in-law owns a four hundred-year-old farmhouse in a small village in Germany. They keep it modernized even with the foot thick walls. In the United States developers rule. Q: Why is street photography important? Steve Weidman: I use it to tell a story, try to focus on what most people try to avoid, to turn their head the other way. What I did for most of my life, avoid the reality of the streets. You have to live in a city to really see the streets, you don’t see the streets in small town America as much. When I photograph people in the street, I engage them in a conversation, I want their permission to photograph them, keep their dignity. So, I am not the type of street photographer that takes pictures of people without permission. I don’t like to invade privacy.